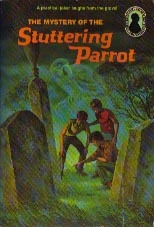 In 1979, a new artist, Robert Adragna, was brought in to create new cover art for each new Three Investigators title written. In addition, as printings of earlier titles sold through, he created new updated cover art for each of those previous titles. Like the Marchesi Cover paperbacks, Hitchcock's silhouette remained on the spine of the book. With the new Adragna art, Random House added the Hitchcock silhouette to the upper right corner of the front covers. Thus, we have a new paperback format known as the Hitchcock Cover paperbacks. All paperback Three Investigators books printed in 1978 and 1979 do not have the number of the title printed on the spine of the book. All but two of the Hitchcock Cover books belong to the First Paperback Edition. Titles #1 and #2 were previously published under Random House's 'Windward Books' and so the Hitchcock Cover paperbacks constitute their Second Edition. One can find First Printings (numberline reading 1234567890) of each of the Hitchcock Covers EXCEPT for the twelve titles previously issued in 1978 with the Marchesi cover art. (*Please see IMPORTANT NOTE at the bottom of this page!) It wasn't until the very early 1980's that new cover art was designed for these twelve titles by Adragna and by this time they had each seen up to nine printings in the Marchesi format. Remember, a change in cover art does not mean that a new edition has been created. For example, #10 Moaning Cave, had eight print runs between 1978 and 1981 with the Marchesi cover art. Adragna's art began appearing on Moaning Cave in 1983 on the 9th Printing of the First Paperback Edition. The only accurate way to determine when the change in cover art took place for these twelve titles is to acquire many different printings of the same title. Moaning Cave, as just described, is one example. Another is Terror Castle which saw nine printings in the Marchesi Cover with the Adragna art appearing on the 10th printing in 1982. We determine the year by the number of titles listed in the book. The 10th printing of Terror Castle lists 34 titles inside - therefore we know the year is 1982. I don't mean to create confusion but usually new titles were issued in the second half of a calendar year in time for Christmas sales - so it is entirely possible that a book like Terror Castle listing 34 titles could actually have seen it's 10th printing as late as Spring 1983 and still only list 34 titles. For the sake of simplicity though, we will assume the former unless and until more accurate information comes to light. It is interesting to note that all twelve of the Marchesi Covers kept the original black and white Harry Kane internal illustrations from the hardback edition. Likewise, these same twelve titles with the Hitchcock Covers by Adragna still contain the internal illustrations. All other Hitchcock Covers DO NOT contain internal illustrations. This was a practice started in 1979 by Random House to reduce the overall cost of producing this series. I believe that the reason the internal illustrations were left in these twelve titles is because of soft-conversion manufacturing procedures - the textblocks with the illustrations were still available. When new cover art became available, the new covers were attached to the existing textblocks. This explanation would also mean that it may be possible to find these twelve Hitchcock Covers with Adragna art and NO internal illustrations. This would have occured once the stock of illustrated textblocks was used up and new textblocks were produced for these books (without illustrations). I would be interested in hearing from anyone who has such books. 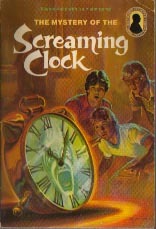 The paperback Hitchcock Covers were available between the years 1979 - 1984. The following is a list containing all of the Hitchcock Covers and the year and order in which each title was first printed in this format. You can view scans of each of the Hitchcock Covers by visiting the Original Series page on this site. The following nine books contain the Bookmark/Mystery Quiz page. This page was definitely available in all First Printings of these titles and in some Second and Third Printings. The bookmark can only be found in these titles printed in this year. Click on Bookmark/Mystery Quiz to find out more. * IMPORTANT NOTE - At this time it is doubtful that titles #7 Fiery Eye and #8 Silver Spider were manufactured in the Hitchcock Cover format (Hitch silhouette on front cover, Adragna cover art, Harry Kane internal illustrations). I do not know of any collector who actually owns authentic examples - please e-mail me if you own either of these!